We all love making our own homemade christmas cards when we get the time! This is a really simple Christmas craft that children of lots of different ages can do and if they get really enthusiastic you could even get the kids to make enough cards to send to the whole extended family! Check out some of our ideas below for easy homemade christmas cards that kids can make and remember we keep adding new ideas! 1. Cut a large piece of foil and spread with PVA glue on the shiny side. 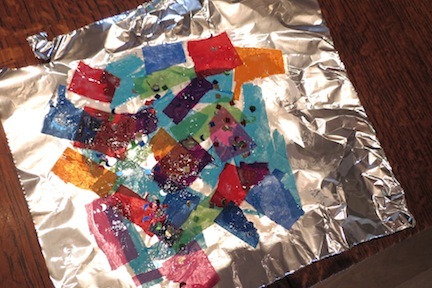 Help your child to rip pieces of different coloured tissue paper and glue down onto the foil. Add other decorations too with plenty of glue. 2. Once dry, draw a simple Christmas tree on the undecorated side of foil, cut this out and cut into strips. Glue onto the piece of folded card stock leaving green tabs between each strip. These bauble and star homemade Christmas cards are made in the same way as the foil tree, but we used glitter glue for the hanging thread on the baubles. 1. 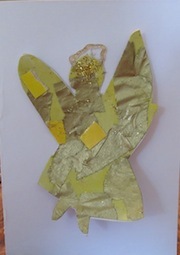 Draw the outline of an angel on your yellow card - children might need help doing this. 2. Before you cut it out let your child decorate the other side of the page with gold tissue paper, yellow paint, gold glitter and glue. 3. When dry, cut the angel out and sew (or glue if easier) it to the piece of folded white card stock with a few stitches. We also used some gold glitter glue for a halo around the head. 1. You first need to decorate the red card. Any young child can do this however you like. We had been doing some potato prints of Christmas trees earlier on red card, so we used these prints. 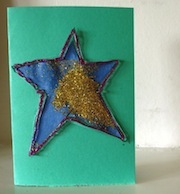 Experiment with any decorated card: why not add sequins or beads, glitter glue, or tissue paper? 2. Once the decorated card is dry, cut out a Christmas tree shape. 3. Gluing the tree to the green card can be a bit fiddly so you may need to help your child. Cut a strip of card about 5 cm long and 3 cm wide, bend it four times and glue it into a square shape. Then glue one side of this this square to the tree and one side to the folded green card. The tree will stand a few centimetres off the card. 1. Cover patches of the paper with glue and sprinkle glitter on it. We do this outside(!) This is fun for kids of any age. 2. 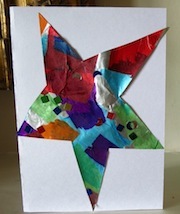 Once dry cut a star out of the paper and glue it onto a piece of card. Cut the star out again leaving a rim of card showing at the edges. 3. 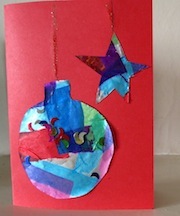 Glue the star to the folded card and go round the rim with a colourful glitter glue.